This half or full day Singapore sightseeing tour is a good preview of what modern Singapore looks like. It's a quick way to see the best of the city on your own pace. For less than the price of a fancy dinner, you can tour few of Singapore's most popular attractions, including the DUCK tour, the Singapore Flyer, the Singapore River Cruise, several museums, and two walking tours through the most popular cultural neighborhoods. If you're just in town for the day and want to do a quick tour of the city without spending hours at each attraction, this self-guided tour allows you to pick and choose the stops you most want to visit. 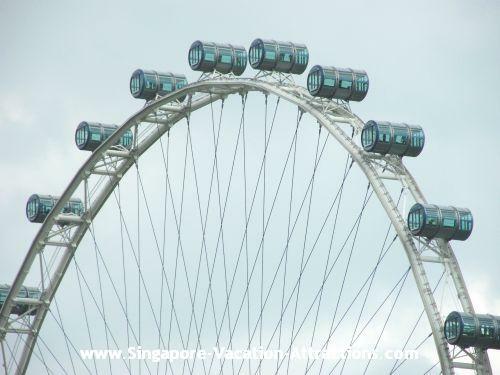 The Singapore Flyer and DUCK tour, are two of the top attractions you won't want to miss. The DUCK is a remodeled World War II amphibious vehicle that can ride on both land and sea. Imagine sitting aboard the vehicle, driving down the streets past all the amazing views, and then suddenly feeling the sway of the river as it slides into the water. The 60-minutes DUCK tour will take you on a journey past some of the most famous landmarks, including Merlion Park, Old Supreme Court and St. Andrew's Cathedral before bringing you to the Singapore Flyer, the world's largest observation wheel, so keep that camera primed and ready. Once you arrive at the Flyer, you'll spend half hour soaring high above the city and admiring panoramic views as far as the eye can see. Old Supreme Court. View More Colonial District Photos. When you're short on time, it can be hard to decide between taking in the culture of the city and snatching up bargains at its many shopping centres. Visiting Little India allows you to do both at the same time. Explore the streets on your own for an hour or two. Make sure you take a moment to experience one of Singapore's best dishes, Fish Head Curry at one of the Indian restaurants along Race Course Road. Also, grab some inexpensive souvenirs for friends and family back home at Little India Arcade and many of the shophouses along Campbell Lane. Garland Stall in Little India. View More Photos of Little India. Indian Restaurant in Race Cource Road. More on Top 10 Indian Food. Use the rest of your time to take a quick cruise along the Singapore River. You can relax a bit while admiring the sights and snapping a few last-minute pictures for your photo album. The relaxing ride will take you past the scenic Merlion Park, Esplanade-Theatres on the Bay, Marina Bay Sands Integrated Resort and the massive Singapore Flyer, giving you another chance to snap pictures if you missed any sites during the DUCK tour. If you have a full day or two to spend touring Singapore, you can tailor your tour to your own needs by using the hop-on, hop-off HiPPO bus system, with buses arriving at each location every 20 minutes. With three different routes, the bus system covers nearly the entire city. The Heritage Route takes you from north to south, and is ideal if you want to take in the major cultural areas, like Little India, Chinatown, and Kampong Glam. The City Route connects you to all the major Shopping Malls and Hotels in Marina Bay area, and goes past attractions like Marina Bay Sands and Clarke Quay. The Original Tour route is a combination of the two. Kampong Glam. View More Kampong Glam Photos. The DUCK Tour and the Singapore Flyer are still two "don't miss" attractions, and since you have more time, you can linger at the Flyer a little longer to sample some local fares at the Singapore Food Trail located at the ground floor. If you're truly adventurous, head to the Kenko Reflexology and Fish Spa, and let some Turkish "Doctor Fish" nibble the dead skin off of your feet, revealing the healthier skin beneath and leaving your tired feet feeling refreshed and rejuvenated. Several museums are easily accessible by the hop-on hop-off HIPPO bus system, so take an hour or two to immerse yourself in some of Singapore's rich history. The Asian Civilisations Museum is a great choice if you want a complete overview of the entire history of the region. If art is more your forte, you can't go wrong with the Singapore Art Museum. This contemporary art museum features both local artists and international works through its partnership with several other big-name museums, including the Louvre in Paris. Tour around Chinatown is another great way to combine shopping and a cultural experience. Explore the area to learn about the early life of the Chinese emigrants, and then grab some souvenirs at a great price. The Chinatown Heritage Centre is great for a quick overview of the early days through the present, and the Sri Mariamman Temple is definitely one photo opportunity you'll want to see. Sri Mariamman Temple. View More Chinatown Photos. China is very well known for its tea, and you'll find that the emigrants brought that very important piece of culture with them to Singapore if you stop in to the Tea Chapter located at 9 Neil Road. The three-storey shophouse serves a myriad of teas and sells all the tools you need to brew your own. Even if your main goal is shopping and major sightseeing, find a way to fit the Singapore Botanic Gardens , the only Singapore's World Heritage Site, into your schedule. The National Orchid Garden, located just next to the Ginger Garden, is a stunning vision, with thousands of varieties and hybrids of the orchids. Sightseeing is very stimulating, and it's a good idea to take a breather and relax. There is no better place to do that than surrounded by some of the most beautiful visions of nature in the entire city. If you have more days to spend, you may want to check out the following self-guided tours.